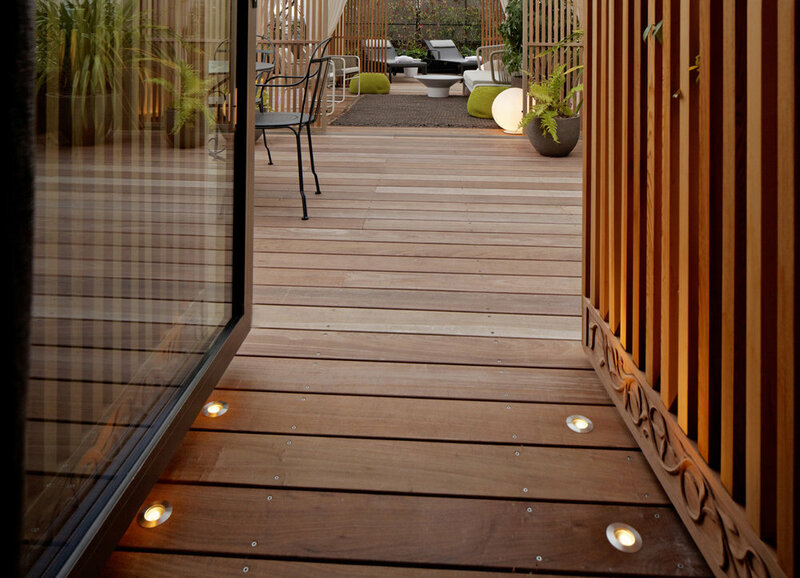 On the occasion of the terrace refurbishment of the “Penthouse : I love Paris” of the Mandarin Oriental in Paris, the Agency Christophe Gautrand & Associates imagines a terrace with an Eastern-Parisian atmosphere divided into a living room, a sundeck and a potted garden with a dining area. The lines, the materials and the decorations create a unique, noble and elegant place at the image of the Mandarin Oriental Paris. Connected to the terrace of the Royal Oriental Suite the Penthouse offers a space of more than 150 sq. meter whose ambiances and uses complement each other. Bas-reliefs with floral patterns of Baroque style (17th century) are built into the wooden screen walls that lead to the terrace so as to surprise visitors. At the foot of a Japanese maple tree, two sun loungers and adjustable wooden screens invite the visitor to relax, to isolate or to play with the views of Paris monuments including Place Vendôme, Opera Garnier and Madeleine Church.